Let’s get to bouncing with Statesboro bounce house rentals from Leap Joy inflatables! Bouncer rentals are great entertainment for kids of all ages for lots of different events. We love bringing our inflatable rentals to birthday parties, festivals, schools, churches, corporate events, daycares, and more! There is always a good reason to rent a bounce house! Leap Joy also has themed bouncers that look great with your themed party. Themed Bouncer Rentals are popular and really bring your party together. Click here to see our themed inflatable bouncer rentals. Check out our Football Bouncer Rental! 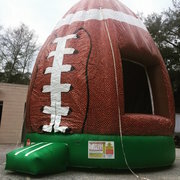 This inflatable rental is great for super bowl parties and end of the season parties. Click here to reserve your today! Do we need to roll out the red carpet for your royal guests? We have a lovely Disney princess bouncer rental that is perfect and will put a smile on all the little princesses faces. Leap joy is ready to get the party started with Statesboro Bounce House Rentals! We strive for 100% customer satisfaction for all of our customer and our friendly staff does just that. We a are a full-service party rental company. Contact us here today to get started on your event rentals.